Lizards and birds species made their way to sanctuaries, giving natural the environment a natural feeling. The Last Great Ape Organization (LAGA), Cameroon has been leading the fight against illegal wildlife trade for several years. In 2016, LAGA rescued one Chimpanzee, took to a rehabilitation sanctuary and seized 64 primate skulls (46 from chimpanzees and 18 from gorillas). It worked with the Ministry of Forestry and Wildlife in Cameroon (MINFOF) to arrest ‘34 major traffickers at a rate of one for each 11 days period.’ LAGA says it ‘observed corruption’ and ‘combated it in a number of the cases’. To reduce corruption, the Minister of Forestry and Wildlife, Ngole Philip Ngwese set up a corruption-debunking platform that encourages individuals to report illegal wildlife trade and other unruly practices in the sector. These efforts often pay off. On April 16 2017, LAGA teams worked with law enforcement officers a trafficker with 118kg of pangolin scale and had rescued 300 African grey parrots the previous month. Now that the forests are turning into brutal, boundless hunting grounds, where can rehabilitated species from the sanctuaries settle? Over 16 species of primates, birds, bushbuck, and reptiles live at the Limbe Wildlife Center (LWC). LWC is a conservation rescue focused rehabilitation and reintroduction project initiated in 1993 by Pandrillus and the government of Cameroon. Pandrillus is a NonGovernmental Organization (NGO) with headquarters in Nigeria, founded by Liza Gadsby & Peter Jenkins. Over 22 years, the Center has rescued more than 450 animals. It now hosts over 380 species and has successfully rehabilitated, and released more than 2,000 African Grey Parrots back into the wild. 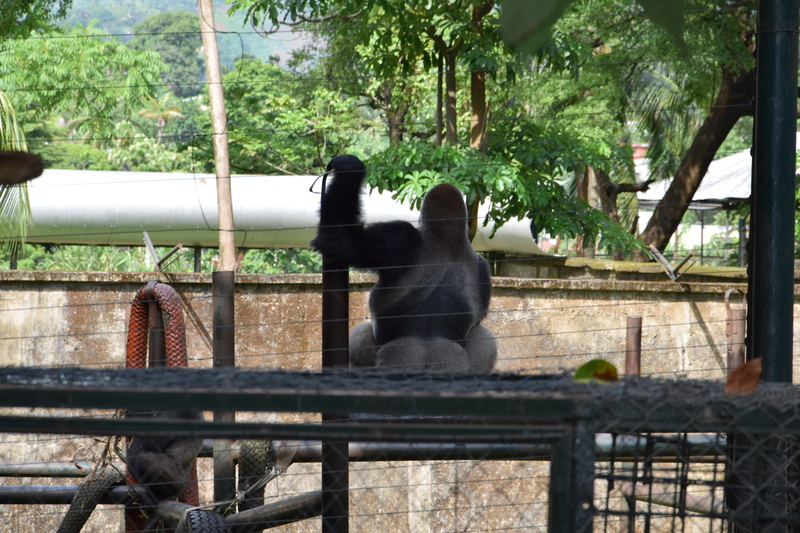 Gorillas, chimpanzees, drills, mandrills, preuss monkeys, and crocodiles are some of the species that live here. The site attracts visitors from all over the world. ‘This looks like exactly like a real person,” says a visitor pointing at chimpanzees in the chimpanzee section of the center. They are a dozen of them visiting this late afternoon of April 30, 2017. It estimates say since 2011 an average of forty-eight thousand people visits the Center each year. Every day, dozens of visitors go to sanctuaries in Cameroon. LWC appeals to humans as well as other animal species not under rehabilitation. It attracts dozens of birds who come for reasons science is yet to explain. Among the visitors, the most common are the known swallow birds. Swallows hunt insects for food. They hunt two types of insects: ground and flying insects. The former involves insects like termites, beetles, caterpillars, worms and ants while the latter involves mosquitoes, flies, moths, foliage insects – scale, bugs, aphids, insect larvae, spiders and crickets. The presence of some these species, visible in the necked eyes in the area could explain their visit, perhaps another reason. Among all the species that live at LWC, one is not rescued, not being rehabilitated and is not introduced. It made its way into the area. The Agama agama lizard (Agamidae), a common invasive species in Cameroon has made LWC a home. It is not clear how many of this species live at the Center but visiting LWC, they are one of the most visible things you get to see moving around. Nevertheless, scientists found twenty-seven lizard species at Mount Cameroon, some 32 kilometers from Limbe. The carnivorous reptiles feed on ants, spiders, termites, cicadas, small mammals and even other lizards. The abundance of insects in the area may have attracted them. Although not enough attention drives to the role visiting species play in making this environment habitable for the rehabilitated species, research focused on them could reveal incredible insights for science.